The North Atlantic between Newfoundland and Ireland is practically the only region of the world that has defied global warming and even cooled. Last winter there even was the coldest on record – while globally it was the hottest on record. Our recent study (Rahmstorf et al. 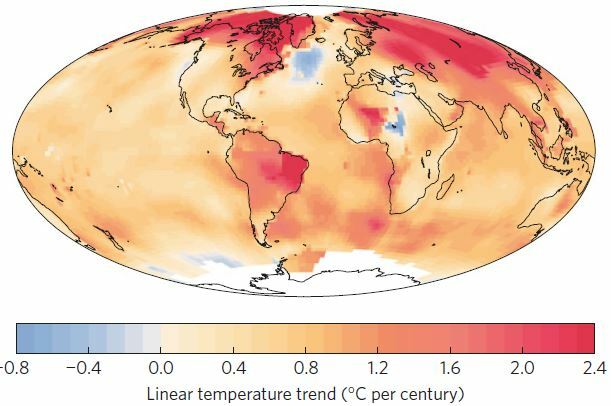 2015) attributes this to a weakening of the Gulf Stream System, which is apparently unique in the last thousand years. [...] It happens to be just that area for which climate models predict a cooling when the Gulf Stream System weakens (experts speak of the Atlantic meridional overturning circulation or AMOC, as part of the global thermohaline circulation). That this might happen as a result of global warming is discussed in the scientific community since the 1980s – since Wally Broecker’s classical Nature article “Unpleasant surprises in the greenhouse?” Meanwhile evidence is mounting that the long-feared circulation decline is already well underway. In seinem Beitrag skizzierte der Postdamer PIK-Forscher ein wahres Klimahorrorszenario und suggerierte, dass alles noch viel schlimmer kommen würde als sowieso schon befürchtet. Deep convection is presumed to be vital for the North Atlantic Meridional Overturning Circulation, even though observational evidence for the link remains inconclusive. Modeling studies have suggested that convection will weaken as a result of enhanced freshwater input. The emergence of anomalously low sea surface temperature in the subpolar North Atlantic has led to speculation that this process is already at work. Here we show that strong atmospheric forcing in the winter of 2014–2015, associated with a high North Atlantic Oscillation (NAO) index, produced record mixed layer depths in the Irminger Sea. Local mixing removed the stratification of the upper 1400 m and ventilated the basin to middepths resembling a state similar to the mid-1990s when a positive NAO also prevailed. We show that the strong local atmospheric forcing is predominantly responsible for the negative sea surface temperature anomalies observed in the subpolar North Atlantic in 2015 and that there is no evidence of permanently weakened deep convection. Ganzen Artikel in der Washington Post lesen.